The intent of this course is to review the entire IP and file based architecture, the changes in workflows and the broad spectrum of technologies that make up the environment. The transition to an IP infrastructure supporting file based broadcast and production came about more quickly and completely than any of the other recent changes in the broadcast and production industry. The course will show how this is a transition that is dependent on people, process and technology. The way content is produced, handled, managed and monetized has changed. All aspects of broadcast and production have changed. New platforms have different production values and requirements to provide a rich user experience. The introduction of non-linear editing (NLE) started the transition to file based production. The first truly non-linear editor was introduced in 1971, non-linear editing with computers was introduced in 1989. The early content to be aired played out direct from a server was commercials and short form programs managed by an automation system. The files were decoded and played as analog in the early 1990s. These systems expanded to enable full long form programs then to an automated playout system integrated with file based commercial insertion. First, we moved from analog linear to digital (SD/HD-SDI), then to IP- and file-based; and from a single format of distribution (television) to many different platforms (smartphone, tablet, Internet and mobile). There are new skills and knowledge needed by broadcast engineers; the infrastructure has changed to servers, storage and IP switching. The lifecycle of media has evolved into distribution to different digital platforms with metadata, media asset management, rights management and tighter technology integration between business units. One of the early misconceptions of digital and file based production was generational loss. In the analog world, it was understood that each transfer of material from tape to tape degraded the product. When digital was introduced, there was theoretically no longer generational loss. Then we discovered compression. As SDI content moves between file based systems, repeated applications of compression and decompression can cause also cause generation loss. The term for this is concatenative loss. If the file moves over an IP network, there is no additional loss. 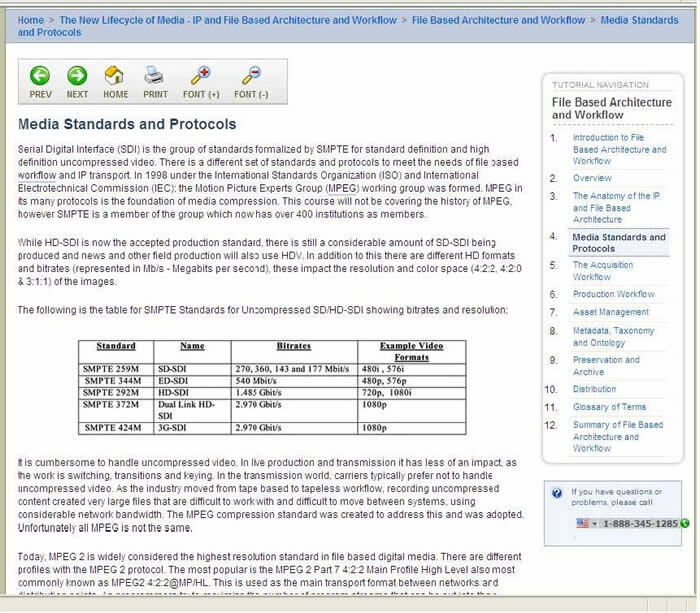 When the format changes in the IP and file-based ecosystem, converting files does not require being un-compressed and re-compressed. If transcoding is required, there are possible differences in the file structure and there is the possibility of loss. However by maintaining consistency in the file based ecosystem, one immediate benefit of a complete IP architecture is the preservation of quality. This new media lifecycle has brought a new vocabulary and lexicon into broadcast. There is tighter integration between departments and systems. This course reviews how metadata (data about data) is used to describe, control and manage the media (asset, essence, content). There are new rules and policies that govern the use and access of metadata; and the integration between departments. Chief engineers, station managers, broadcast and production engineers, media IT engineers, IT technicians and managers will benefit from this course, as well as anyone working or looking to work in media production & distribution and content creation. all the technical considerations that need to be taken into account in a file based architecture. the changing roles and responsibilities engineers will have in designing and maintaining these new systems. the new jobs / roles that are necessary in handling media in this architecture. the changes in workflow and business processes. Gary Olson is a media technology and business advisor specializing in the transition of traditional media workflows and business processes. He is a recognized industry leader with practical experience in the analysis, selection and uses of technology and is an innovator in media technologies and broadcast design. He holds a US patent in streaming media automation and distribution. His skills include project management planning, budgeting, implementation costs, risk management strategies, and managing project portfolios. As a technology and business process analyst, he assesses end-user requirements, identifies risk and evaluates how the technology architecture aligns with future trends. Additional expertise includes broadcast, digital asset management, interactive telecommunication, distance learning, and digital media distribution. His company, GHO Group LLC, advises on the best use of technology in the migration and transition from traditional media technology to digital platforms in broadcast, broadband, wireless, portable multimedia and on-demand media and information technology. The company's focus is the adaptation of organizational structure, staffing models and workflows to implement digital media technology. Olson and GHO Group have substantial experience working with project sponsors and stakeholders to help them understand the changes associated with digital media platforms and file-based workflows.